Halloween is a fun time of year when you can literally be anything you want. It's even better when you get to party with your closest friends and family. 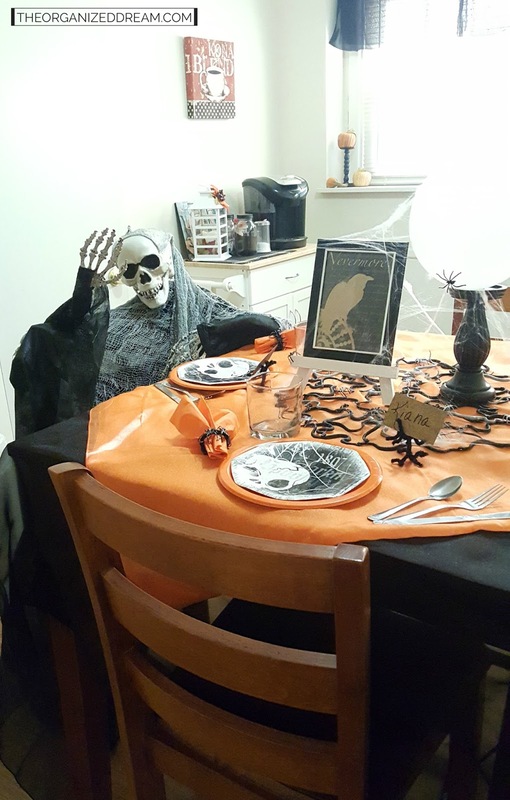 What better way to really show that Halloween spirit than by decorating an amazingly scary good table everyone would die to sit at? One of the best places I have always used for party decor is Oriental Trading. I've used them to buy awesome party decor for my daughter's parties. My husband has even used their products for business functions, too! That's why, when I had the opportunity to collaborate with them on a fun and spooky Halloween themed post featuring their products, I jumped at the chance! There are quite a few products and projects used from their site in this post while I have also included some of my own decorations as well. Needless to say, I'm really stoked at how it came out! After visiting their Halloween page, I was immediately inspired and couldn't wait to get to work! I ended up with so many ideas, I had to ask my daughter for help. Ultimately, we narrowed it down to these. 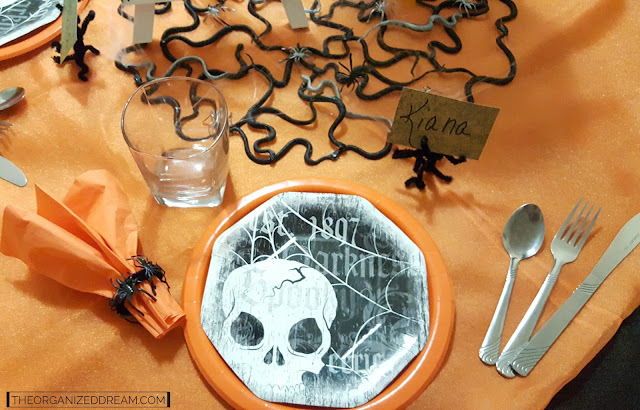 The first project we worked on was this creepy, crawly snake and spider place mat. I only had to use craft paint and a hot glue gun to create this unexpected accent and it took little to no time at all to put together. The original tutorial shows this idea in all black. 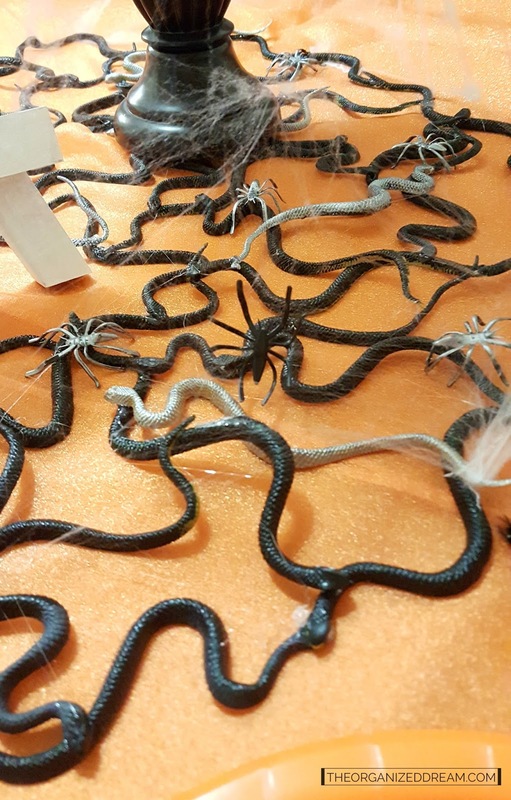 I painted a few snakes and spiders silver to really stand out instead.. You can find out how to make your own by using this tutorial. I wanted a little something out of the ordinary so when I saw their DIY magic crystal ball idea, I knew it was going to fit in perfectly. 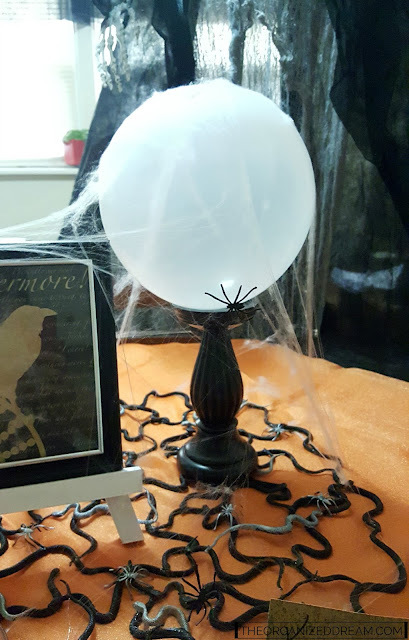 I used a balloon, glue dots to secure the balloon, a candle stick and webbing to add the finishing touch. You can check out the tutorial here. I added a couple more little touches to tie everything together. These easy Haunted Tree Placecard Holders are made from chenille pipe cleaners. I'm not going to lie, it was a little challenging to get the branches to sit right, but with a little handy work, I think they came out pretty darn good. Check out the tutorial here. I came up with the idea to make my own napkin rings since I had a boat load of plastic spiders left over from the place mat project. Using my hot glue gun, I added the spiders around a chenille pipe cleaner that I twisted into a circle. Easy peasy (and just the thing to jazz up plain paper napkins,too)! Here is a look at the place setting in it's entirety. I really like these skull plates. They're the perfect dessert size and worked amazingly with the orange plates and napkins. 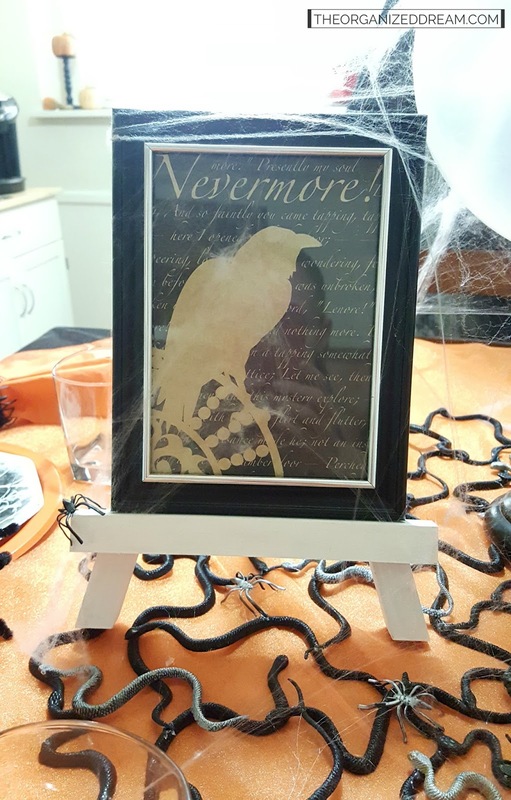 They also tying in the colors of the framed paper art and the Edar Allen Poe idea. 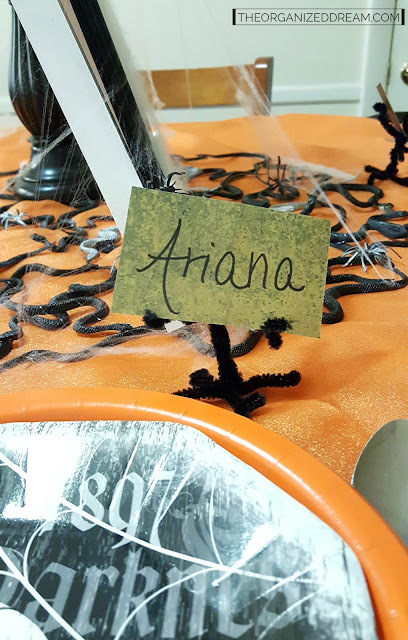 Again, don't forget to check out their Halloween party page where they have a great assortment to choose from! Now all I have to do is find the perfect Halloween costume which shouldn't be that hard since Oriental Trading also has a great selection to choose from. Scope out their Halloween Costumes Page. Looking for more inspiration? 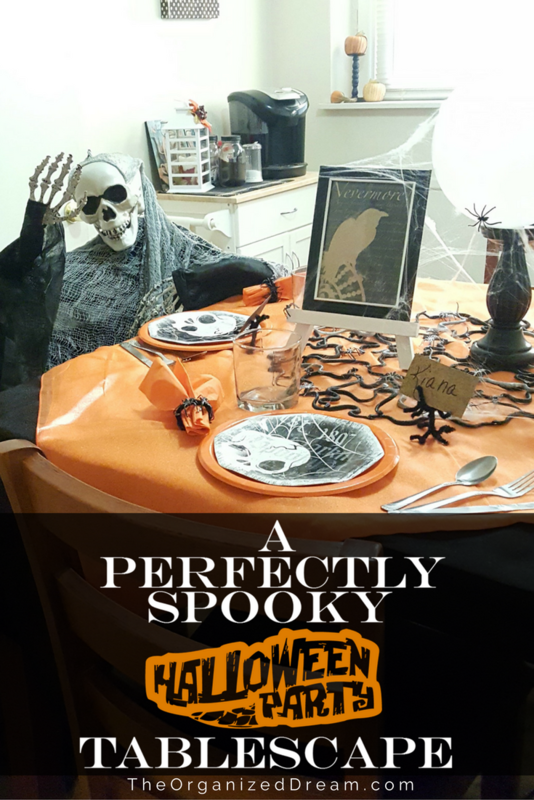 They have a website dedicated to Halloween with loads of decor and craft ideas, recipes and DIY costume ideas! Visit FreeFunHalloween.com and see what I mean! Please note that while I was provided with products to complete this post from Oriental Trading, all opinions are my own. Oriental Trading has such a huge selection of party supplies! Your tablescape looks so fun! Love your Poe selection too! 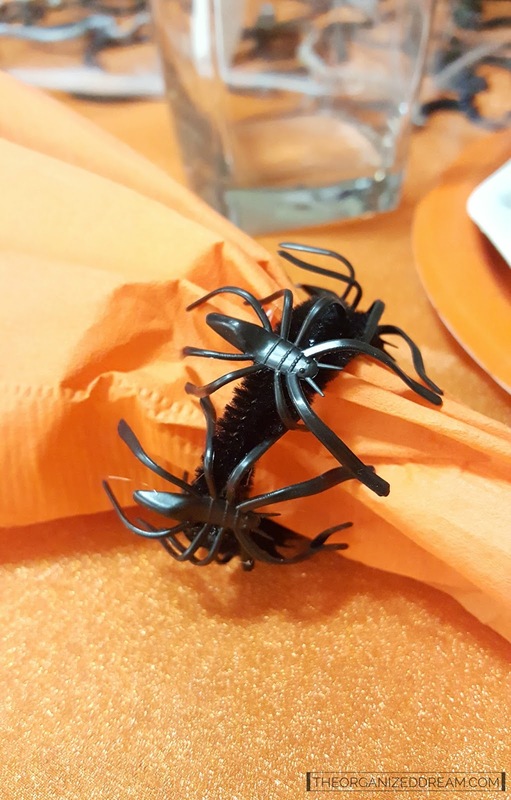 The snakes and spiders are such a great touch to the table. 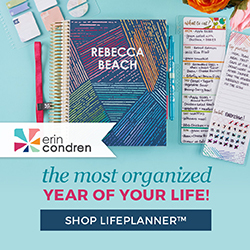 I love how easy Oriental Trading makes party planning so easy. Thank you! They really do. I've loved shopping with them for years! How fun! What a great way to entertain your dinner guests! Pinning. Thanks for sharing at Snickerdoodle Create~Bake~Make Party. I love the snake mat!!! I think I may need to steal it for my house. 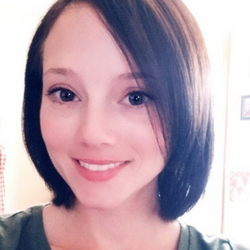 Super cute, so glad I found you on the Monday Madness Link Up. this is so fun! I love this set up!